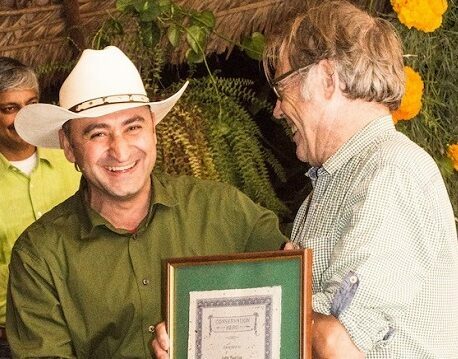 After six years of working together, WLT partner Asociación Armonía and Moxeño communities have saved more than 6,000 Macaws in Bolivia by promoting the use of alternative feathers made of organic materials in traditional headdresses. For one day a year, the city of Trinidad is transformed into a cornucopia of culture for the Chope Piesta, as the city celebrates the syncretism of Spanish Catholicism and indigenous belief systems when it was founded 330 years ago. Within the festival of music and dancing, the Moxeño people wear long cotton robes and elaborate headdresses consisting of around 30 long, colourful feathers to perform Machetero ritual dances. 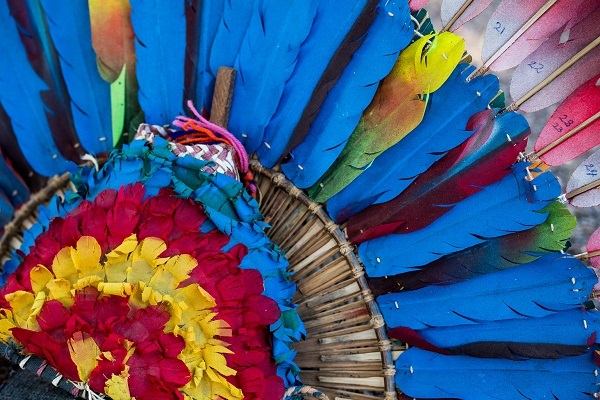 By running an educational campaign about the ecological impact of using Macaw feathers, in particular the plight of the Critically Endangered and endemic Blue-throated Macaw, and promoting the use of alternative feathers, at this year’s Chope Piesta headdresses with alternative feathers outnumbered natural ones five to one. Before Spanish colonisation, the Moxos Plains were inhabited by the Moxeño tribes, who considered themselves the guardians of nature. The Moxeño would dance to the rhythm of the pífano flute, paichichi rattles and drums to praise the jaguar, the birds and the rising sun of the Beni savanna. The alternative feather programme has empowered the Moxeño people to embrace this part of their culture, as well as providing an alternative income for the Moxeño community, as headdresses with alternative feathers are sold as souvenirs to tourists. Blue-throated Macaws have become threatened by extinction due to the illegal pet trade and habitat loss, and Armonía also works towards their conservation by managing key macaw habitat in Barba Azul reserve, installing nest boxes and employing rangers to protect the birds from theft for the pet trade.